It’s been a busy few months at house51 so there’s been a bit of a lull in our blogging activity. We thought we’d get back on course by updating you an a few things we have been up to in recent months. Back in March we gave a presentation at the IIEX Europe conference in Amsterdam with our friends from Chime Insight and Engagement. Our theme was Innovation Through Collaboration- you can get a copy of the presentation here. IIEX stands for ‘Insight Innovation Exchange’ so we decided to take the direct route and kick off by posing a fundamental question to our audience- what do we mean by insight? Most researchers take the answer to this question for granted. For many it seems obvious that insight is about puzzle solving and prediction and that we are in the business of selling certainty. 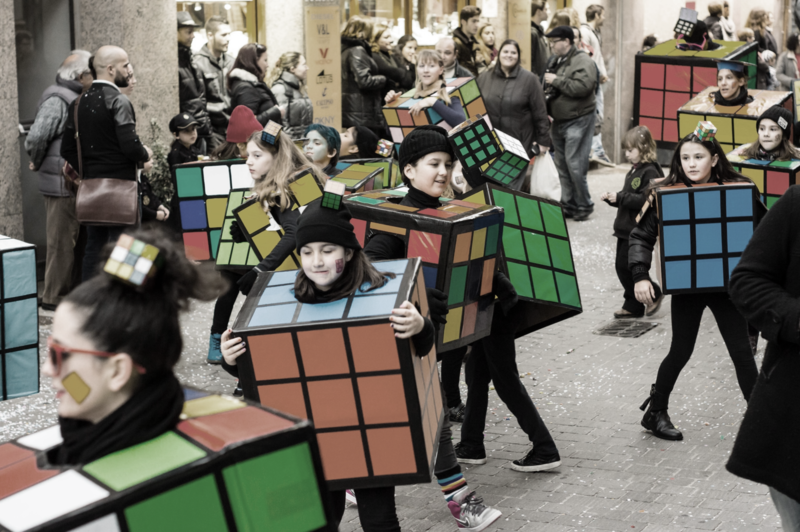 This is based on the conceit that people, like the human rubik’s cubes in the picture above, are entirely knowable, their secrets waiting to be unlocked if we can just find the right algorithm or research methodology. But the real world is far more messy than any of us like to admit. And certainty is illusive. So at IIEX we argued that we need to think differently about insight- it’s not about obtaining certainty, it’s about managing uncertainty. Getting comfortable with uncertainty can lead to better decision making. And psychology and behavioural economics show us the way. We’ve written elsewhere about the ‘illusion of control’ which has a necessary and important role in sustaining life in an uncertain and infinitely complex world. It would be difficult for any of us to function and get out of bed in the morning if we didn’t believe we could exercise personal choice and achieve a significant degree control over our environment. In fact ‘positive illusions’ like the illusion of control have been shown to be associated with good mental health- conversely people suffering from depression exhibit lower levels of positive illusions. So what’s this got to do with the insights industry? We think the parallels are clear. Pollsters and market researchers still live or die by their ability to predict what people think, feel and do about everything from trivial brand choices to the most fundamental constitutional questions about the future of the 5th largest economy in the world. But the overconfidence of our own predictions may not be serving our clients well. Many market researchers suffer from their own unrealistic perceptions of control. The majority of the industry continues to cling to a narrow range of explicit survey and focus group methods that overestimate peoples capacity for rational, conscious deliberation and the accuracy of our predictions about our own behaviour. Behavioural economics is a descriptive discipline that has systematically challenged many of the axioms of the standard rational model of behaviour and decision making. But, as we have highlighted before, despite the hype, the application of these principles has yet to move into the mainstream of commercial market research. One approach that is beginning to challenge the orthodoxy is implicit research. At IIEX in Amsterdam we showcased our IRT (Implicit Reaction Time) approach which offers a practical and scalable way of bringing behavioural economics and an understanding of real world behaviour into the mainstream. The IRT is adapted from the pioneering academic work on the IAT conducted by Anthony Greenwald and others (See Harvard University’s Project Implicit for IAT research on range of issues including unconscious gender, age and racial bias). It applies the principles of psychological priming and the measurement of reaction times to discriminate between automatic and psychologically certain ‘System 1’ responses and slower more deliberative System 2 responses. Crucially it is the slower ‘System 2’ responses, favoured by traditional market research, that are often less reliable and certain because they represent over rationalised or socially desirable responses that distract people from the gut reactions that govern and predict most behaviour. In 2016 we have applied the IRT to a diverse range of social and market research briefs including evaluating attitudes to disabled people’s participation in sport, the generational divide in the UK, advertising evaluation for charities and auto manufacturers and trust in high street and online retailers. What unites all of this work is that it offers an alternative to the illusion of control of traditional explicit research. By differentiation between fast and slow responses the IRT provides our clients with more a realistic appraisal of the certainty of people’s attitudes and intentions. Or to put it another way, it helps our clients manage uncertainty.